SAN LUIS OBISPO — Cal Poly’s Bachelor of Architecture program continues to be regarded as No. 1 among public universities in the U.S., according to the 2018-19 DesignIntelligence rankings of the country’s most admired architecture and design schools. Out of more than 50 accredited undergraduate programs in the nation’s public and private schools of architecture, Cal Poly placed third overall among the 35 ranked by DesignIntelligence. Cal Poly’s architecture program also placed in the top three in 11 out of 12 undergraduate design education focus areas in the annual survey of hiring professionals about which undergraduate programs are best preparing students for professional practice. The architecture program was identified as the best in the nation for seven of those areas including: construction materials and methods, engineering fundamentals, healthy built environments, transdisciplinary collaboration across architecture/engineering/construction, project planning and management, practice management, and sustainable built environments/adaptive design/resilient design. “We are exceptionally proud of our students, faculty and staff in sustaining excellence in architectural design education that continues to be recognized by the profession,” said Professor Margot McDonald, who has served as head of the Architecture Department since 2013, when the program was first ranked No. 1 in the nation by DesignIntelligence. In addition, Cal Poly’s Bachelor of Landscape Architecture program is No. 1 among public universities on the West Coast and garnered sixth place in the national ranking of the 25 most admired public and private undergraduate design schools. In the design education focus areas surveyed, the landscape architecture program placed in the top five in 11 of 12 focus areas: communication and presentation skills, construction materials and methods, design technologies, design theory and practice, engineering fundamentals, healthy built environments, interdisciplinary studies, transdisciplinary collaboration across architecture/engineering/construction, project planning and management, research, and sustainable built environments/adaptive design/resilient design. In a separate survey category for programs of near equal size from which practitioners have hired the greatest number of undergraduate and graduate students in the last five years, Cal Poly’s architecture and landscape architecture programs were both ranked in the top 10 nationally. The ranking results are based on surveys conducted by DesignIntelligence. Data for the 19th annual survey was gathered from more than 360 leaders of design schools and 6,000 design practitioners who hire and supervise graduates of architecture, landscape architecture and interior design programs. In addition, nearly 5,500 students participated. To view the results, go to www.di-rankings.com. For more information on DesignIntelligence, visit www.di.net. Cal Poly landscape architecture students examine design concepts and site models. 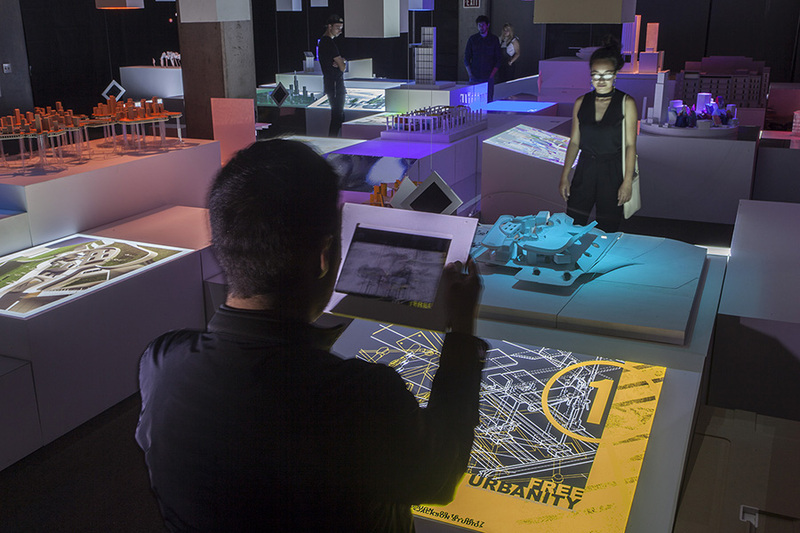 A Cal Poly architecture student explores design possibilities through an augmented reality interface. 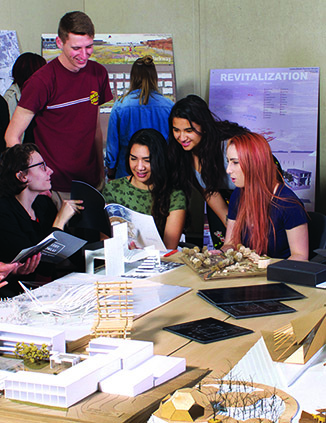 With more than 1,900 students, Cal Poly’s acclaimed College of Architecture and Environmental Design (CAED) offers eight degree programs in five closely related departments: architectural engineering, architecture, city and regional planning, construction management, and landscape architecture. For more than half of a century, the CAED programs and 16,000 alumni have been a positive influence on the planning, design and construction worlds. More information is available at www.caed.calpoly.edu.